I'm usually reading about 3 to 5 books at any given time. There is always one in my purse, a few on the nightstand, and others tucked around the apartment wherever I left them. I'm a quick reader, racing through both fiction and nonfiction (the latter usually food related, though I also have a thing for essay collections by Nora Ephron). I also admit to sometimes pulling all-nighters when the book is really good. I usually prefer literary fiction (I'm at the heart of it all, a total nerd), but I do admit to having a VERY soft spot in my heart for cozy food novels that I can just escape right into without really having to think. 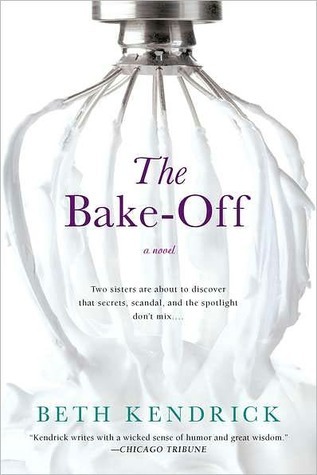 You know what I mean--silly mysteries about poisoned chocolates or disappearing cakes, romances between chefs and cranky restaurant critics, and, like the book I'm giving away to you today, heartwarming stories about family brought together through the power of the kitchen. I breezed through it quickly and thoroughly enjoyed the story of these girls and their grandmother. I think the only thing that drove me a little crazy about the book (without giving anything away) is the way Linnie chose to deal with the theft that got her into the whole situation. Maybe it's just the New Yorker in me, but I would have called the cops on that guy so fast, regardless of his sob story. Although I suppose had she done that there would have been no plot. I have two copies of the book to give away today! To enter: leave a comment below telling me what dish you would make if you were forced to enter a cooking or baking competition. You have until 11:59 PM EST on Tuesday, May 10 to enter. One entry per person. US residents only. Two winners will be randomly selected using Random Number Generator and announced on the 11th.